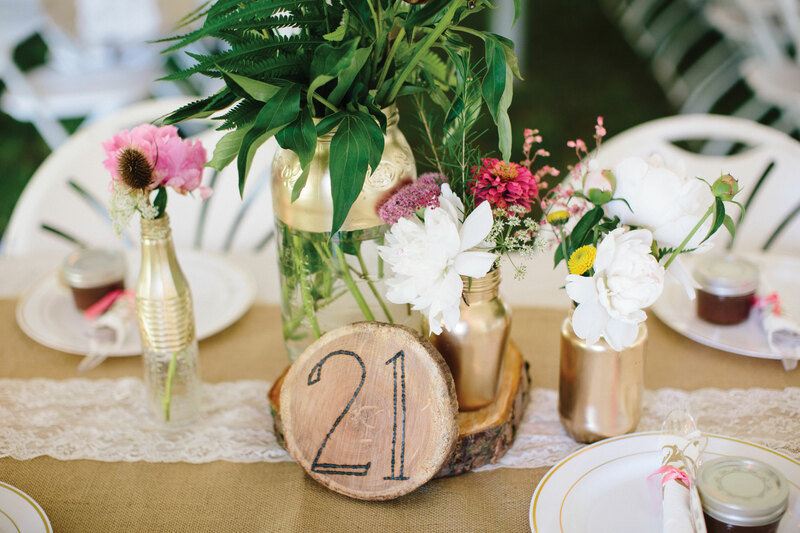 Personal DIY touches made for a special day these couples will never forget. What made our wedding unique: Wooden textures for table tops, cake and pie stands, signs, and table numbers; handmade centerpieces and runners by the groom’s grandmother; custom designed invitations, programs, and signs by the groom’s sister; chalkboard art and bar drink menu; personalized cake topper of the bride and groom; wooden bar built by the bride and groom; homemade apple butter favors by the groom’s mother; boutonnieres with gold bullet shells to capture the groom’s love for hunting; flowers by Greystone Flower Farm arranged uniquely by family; homemade cakes and pies by family and friends; and more. What made our wedding unique: Handmade jewelry; lace from the bride’s grandmother’s sewing kit; diamonds from the bride’s grandmother’s engagement ring from WWII; handmade baskets; natural wood elements from Central Pennsylvania; Utz chip bar; a veil from the bride’s cousin’s wedding; sand collection from East and West Coasts; custom wine labels; a memory table; desserts made by the groom’s sister; personalized vows; and more. What made our wedding unique: Welcome sign made with original barn wood from the barn at Rodeo Ranch; custom, embroidered handkerchief for the bride’s “something blue” with the initials of the groom’s brother, who was killed in a car accident at 19, and the bride’s late grandfather; custom printed growlers and cuff links with the groom’s father’s rodeo company logo; a mix of bull skulls, cowboy boots, gun belts, and Western longhorn furniture to complete the rodeo theme; antique memorial frame for the groom’s late brother, which included his prize rodeo belt buckles; custom printed wedding programs/fans with a poem by the groom’s late brother; bluegrass music by Bluestone; the couple’s dog, Karma; and more. Ceremony & Reception: Antrim 1844 Country House Hotel, Taneytown, Md. What made our wedding unique: Vintage necklace and earrings hand-sewn with ribbon and gold thread to make the bride’s headband and sash; a blue French knot sewn into the bride’s dress by her mother right before the ceremony using a sample from her sewing kit; a surprise salt ceremony by the officiant; repurposed glass containers and candles; set of candelabras gifted to the couple by the bride’s father with candles placed by the bride’s aunt before her passing; homemade ceremony entrance signs and programs, bride/groom chair labels, and seating cards; and more.